photo of najib with altantuya exists, said… – welcome! … the french reporter, arnaud dubus. it was given to the malaysian police by the mongolia honorary counsul in malaysia, who of course in turn got it from altantuya’s father. hmm… so the photo landed in the hands of the police… the IGP…. AND it stays there. so it kind of add up what RPK said about the IGP and the PM eh? they are scratching each other’s back! 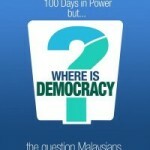 read the full article about what dubus said regarding the photo at free malaysia today, a new online news portal. bear in mind that our dear PM had firmly stated he did not know altantuya at all when he swore on the koran. in other words, he was saying altantuya’s father and cousin, amy (who saw the photo) were liars. and now this french reporter too. vanished? nah, it’s still in the IGP’s hands safe keeping… as a trump card for him to use against the PM, see. and you see, how the IGP’s contract had been renewed? how some charges against him was dropped? Dubus said he doubted if the photograph would ever see the light of the day. “Well, the photograph was given to the Malaysian police; so if we want to check where was the pic, somebody has to go to the Malaysian police and the one who can do it is the Honorary Consul as he was the one who gave it to them,” said Dubus. will he? of course not! he already given it to the police and to him it belongs to the police and up to the police what they want to do with it. and he’s too chicken (or got paid?) to speak up that he saw the picture, he handed the picture to the police. it takes a foreigner like dubus to tell it out. read the full article at free malaysia today, which is a new online news portal. note: the picture here was done by wits0 for famous blogger susan loone, first up on susan’s facebook. what the hell, najib? is this democracy?? 2 Responses to "photo of najib with altantuya exists, said…"
billy, “someone from inside the force”? i think that would be rather impossible. they all either kow-tow to the top man or they are all scared of the top man. it would be good if someone else, not the malaysian police, not any malaysians, but someone who was in paris that time when the 3 of them were together (najib, razak, altantuya) somehow or other got the photo of them together. fat chance i suppose!